Ages from 3 to 9 years. After the cold and interminable days of winter, here come Spring and Easter. Easter is a time to celebrate the renewal of life with flowers bloom, pastel eggs, pink soft rabbits and fluffy chicks, so what better way to embrace this special time of year than with our seasonal Easter party. 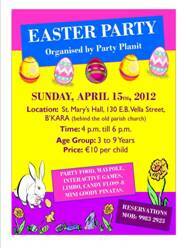 Hop on over for an eggcellent and eggstravaganza Easter party for your kids. Price is 10 euros per child. Price includes games, maypole. limbo, candyfloss and mini goody pinatas for every child. Call on 9983 2923 for further information.